In 1983 the first conceptual design for a new tactical bomber was made. The new aircraft was planned to replace the third generation fighter-bombers and tactical bombers; the Su-17, MiG-27, Su-24 and their derivatives, in the 1990s. The Su-27 would serve as the basis for the new aircraft, designated Su-27IB (factory designation T-10V). IB standing for Istrebitel-Bombardirovshchik or fighter-bomber. The Su-27IB incorporates the heavy payload and combat radius of the tactical bomber and the high manoeuvrability and speed of the fighter, so it could be deployed against ground, naval and also airborne targets. In this view, the Su-34 can be compared to the US F-15E Strike Eagle, which was also developed from a successful and agile fighter into a multi-role tactical strike aircraft. The design was considerably changed from the basic Su-27/Su-27UB. To improve interoperability between the pilot and navigator, the cockpit arrangement was completely changed by side-by-side placed K-36DM ejection seats (as on the Su-24 tactical bomber). In addition the cockpit has been pressurized. The crew is able to lie down or prepare some food in the area behind the cockpit. To improve sanitary conditions the aircraft has also been fitted with a toilet. The cockpit is accessed via a hatch and ladder in the front nosegear well, which was placed more forward and is retracted backwards into the well. To accomodate the new cockpit configuration, additional equipment and increased fuel internal fuel load, the fuselage has changed drastically. The nose section is shaped elliptical, which gave the aircraft the nickname 'Platypus'. The fuselage midsection has been changed to accomodate the increased size No 1 fuel tank. The engine intakes were changed from variable to fixed geometry air intakes. Also the rear of the aircraft underwent changes in the shape, the most recognisable is the new enlarged central tailboom. The wing panels and canards of the Su-27M were adapted for improved flight characteristics and larger fuel cells. All these changes ment an 1.5 increase of the take-off weight. 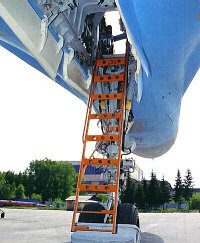 The maximum take-off weight increased from 28 tonnes of the basic Su-27 to 45 tonnes. To cope with the increased weight the mid section was strengthened and a new undercarriage was fitted, the main landing gear single-wheels have been replaced by two wheels placed in tandem. The Su-27IB can carry a large arrange of weapons. The air-to-air weapons inventory consists of Russia's modern air-to-air missiles, such as the RVV-AE, R-73 and derivatives of the R-27 missile. For ground targets the aircraft is capable of both guided and unguided weapons. Guided weapons include the Kh-29, Kh-25, Kh-59M missiles as well as KAB-500 TV/laser and KAB-1500TK TV/command guided bombs. Unguided weapons include 1,500, 500, 250 or 100kg bombs, rockets and rocket pods. Against maritime targets the aircraft can carry up to six Kh-31A or Kh-35 anti-ship missiles. Against enemy air defenses six Kh-31P passive radar homing anti-radiation missiles can be carried. Although after the break-up of the Soviet Union funding has been limited for a new tactical bomber, the development has continued at a slow pace. After the two prototypes (T-10V-1 converted from a Su-27UB, bort number '42', and T-10V-2 bort number '43'), two more prototype Su-34s have been series-produced in 1994/1995 (Su-34 '343' carrying bort number '44' and Su-32FN '349' bort number '45'). Later at least one more flying prototype was produced by NAPO, carrying number '47'. [Editor: Number '46' could have been a static prototype for ground tests.] These were based at the Sukhoi OKB testing base for flight trials until state trials began. The Su-34 was successfully tested in the Chechênia according to Russian authorities, and it also participated in combat exercises at Ashuluk in 1999. Several plans have been drafted for tactical reconnaissance and electronic warfare variants. The aircraft has set a number of world records for flight altitude and payload capabilities. 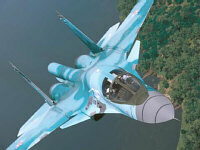 The Russian Air Force sees the Su-32/34 aircraft as its future main tactical bomber which will in conjunction with fourth generation upgrades of the Su-27, MiG-29 and MiG-31 fighters present the bulk of the Russian Air Force inventory in the 21st century. Fomin, Andrei (2006), Russian AF Prepares for First Su-34s, Air Forces Monthly #225, December 2006, p. 20, Key Publishing Ltd, UK.